Anyone who has ever witnessed a dog delightfully roll around in a pile of stink knows that the canine brain operates a little differently than ours. Canine Companions® provides assistance dogs free of charge to adults, children and veterans with disabilities. 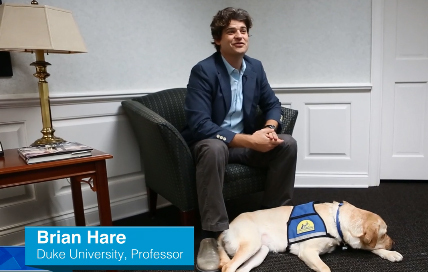 In a new venture between the nonprofit and the North Carolina University, Hare is taking in 8-week-old Canine Companions pups at Duke to study their traits and experiences. Then he’ll track them through formal Canine Companions training to see which qualities turn out to foreshadow success — sort of like the parent of a Rhodes scholar who can boast that his kid memorized the periodic table at 3.